Home > Exterior Design > Light it up! We added a LED strip to enlight the printing surface. Especially with longer prints (which is exactly what our printer does best) the printing time can take multiple days, thus resulting in overnight printing. Since the printer itself has no lighting, its progress is hard to follow at night. Furthermore the only light comes from above the printer casting shadows on the printing surface. This all resulted in the request for a better lighted working surface. We started with placing a single LED strip between both printers and folding it double so it formed a small light bulb enlightening both Ultimakers. This concept proved itself to be convenient directly after connecting by overflowing with light. In order to connect the LED’s correctly we had to wire it to the ‘heater bed’ pin since no other pins were available. This though required us to remove the safety feature from this particular pin in order to send signals through it. Flashing de Arduino board with this update, we were able to power the LED’s. 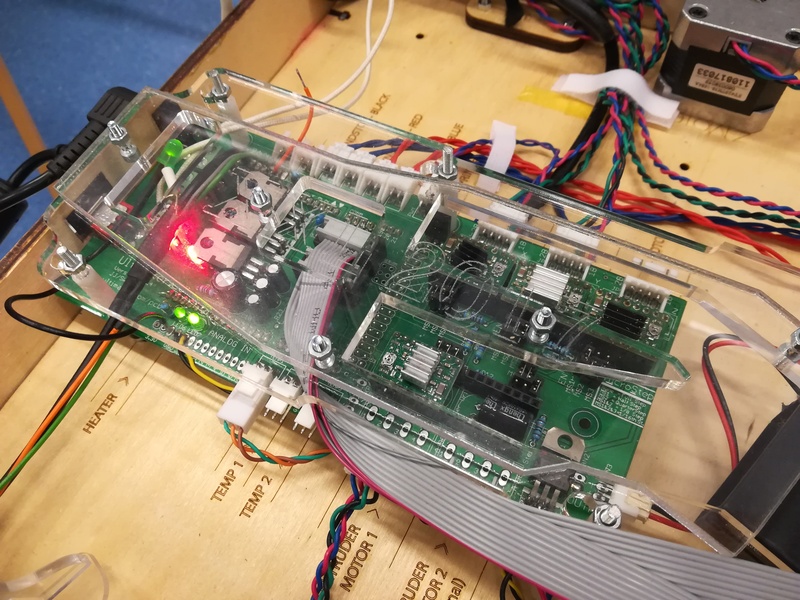 An important thing to keep in mind is that the LED’s we used were only capable of handling a maximum of 12 volts, while the Arduino could power them with 19 volts causing damage. For this reason a maximum brightness value of 150 (on a scale from 0 up till 255) was used. We decided to upgrade the lighting by adding 4 more LED strips to create a more equally lighting of the surface. The 4 LED strip wires are joined as if they are one and are also piloted as one. 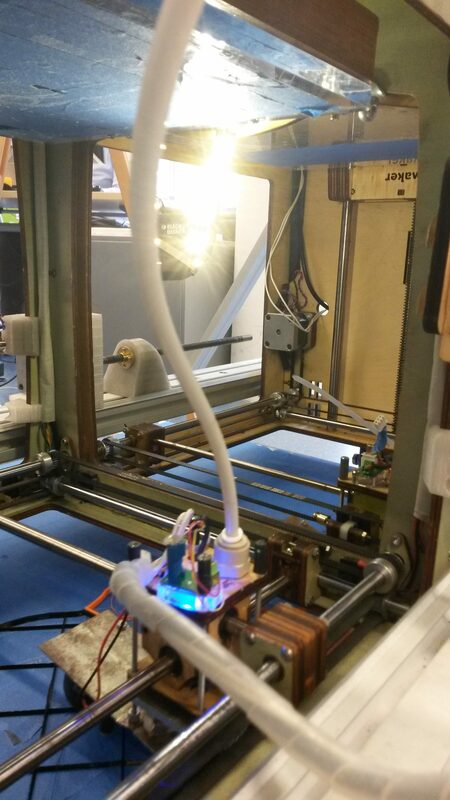 The LED strips are placed on the inside ceiling of the ultimakers (the original work surfaces), two on each side. The final LED upgrade is the addition of multicolor LED’s inside the cover and behind the top cover. This creates a warm glow and a attractive look. The lid up top cover also has a promotional goal, it attracts peoples attention and works like as a brand sign. It could also be related tot the brand signs above the high way. Second the lighting creates a signature look, a special aspect that makes the XXL Ultimaker more special and rememorable.